Of course, none of the nice writer-chums who encouraged me to write the dratted book and to get it published TOLD me that I would feel all of the above. Why didn’t they explain to me that every time I meet someone who has read the damned thing, I would feel just a tad bit unnerved? So I get wound up about chatting to people about my book. So all that I’m left with is the flippant “Blimey. You must have been bored with your life recently, in order to get through all of that.” (And not everyone shares my sense of humour.) Or the shoving of hands over my ears and bursting forth with a song. I find that old Black Lace tracks such as ‘The Conga’ are the best for blocking out any further responses from people. But quite frankly, reacting to people with dreadful 80’s pop makes me come across as a little bit eccentric. So, if you have any suggestions on how I should respond to people’s very lovely and (usually) very warm-hearted approaches towards me in relation to having read ‘Mind Games and Ministers’ – then please do send them on. In the meantime – I want to share one of the latest reviews. A real out of the blue critique. And written by someone which much experience in social housing, who had heard aboout my book. And who’s take on my scribblings had me laughing out loud. In fact, I’ll go with my gut instinct on this one – I’ll just say CHEERS. No fretting over wobbly embarrassing moments. Just a big Cheers to John Perry – Mr Social Housing and International Development Himself and writer of this review who really made my day! Simon didn’t say much. He didn’t have the energy to. Simon (pronounced ‘Sih-mon’ in Afrikaans) is 10 years old but weighs much less than my own 6 year old boy. Who is hardly a big lad himself. Simon is malnourished. Along with his sister, he is an orphan and sleeps wherever he can find a warm corner in someone else’s shack. As a small person who has no-one to keep an eye out for him, Simon has several options in life. He could walk the long road to town in Gobabis (not much fun when you are nearly-starving) and there try and beg for a few pennies off people. Or rummage through the dustbins. Or he could stay in Epako during the day and hope that someone, somewhere might find a bit of maizemail (savoury cereal porrige) to eat and perhaps he might also find somewhere safe and not too dirty to huddle down for the night. Or he could go to school. Simon likes school. He tries to go as much as he can and has been accepted to a school within walking distance from Epako. 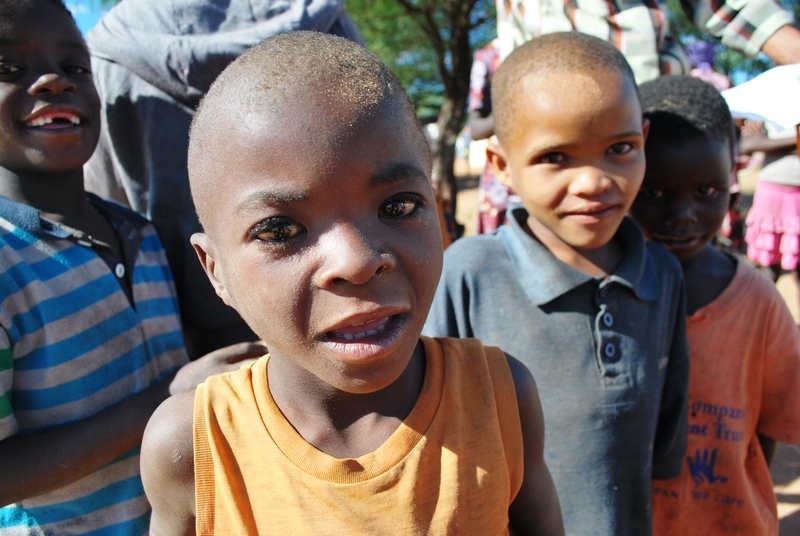 Unlike many of the children, school is a big attraction for Simon because (our friends in Epako tell us) its the one place where he can be assured of getting something to eat. 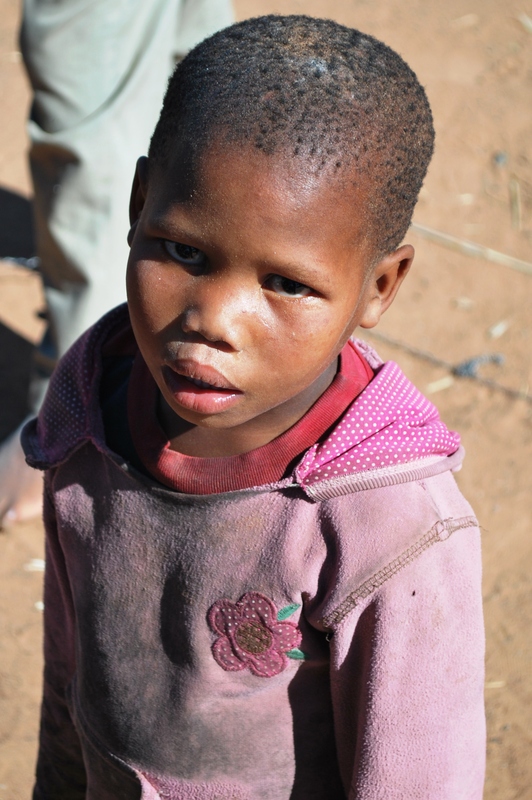 San Bushmen children are some of the most disadvantaged and discriminated in the world. Apologies for the cliche, but this little lass could only dream of a few items of school uniform and a blanket. Schools in Namibia (and in most African countries) also charge a school fee. Again – this isn’t mandatory – but some schools can make it difficult for children to attend if their families don’t pay this fee. 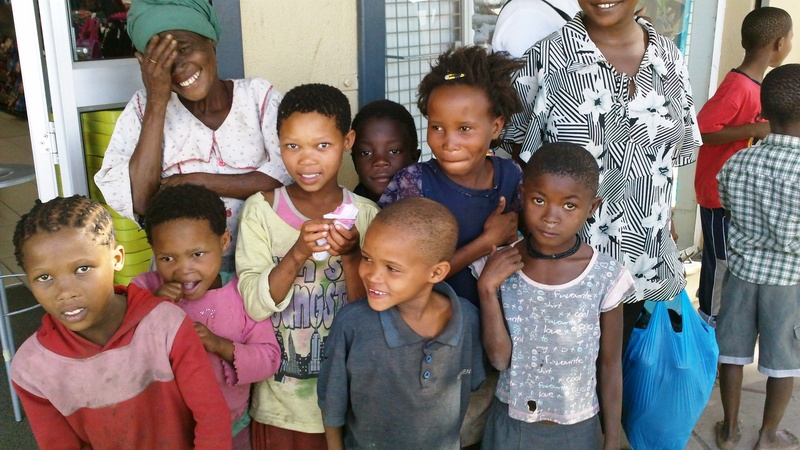 Our previous work in southern Africa, with the San Bushmen made it all too clear that the poorest families need advocates who can write a damned good letter for them and stand up for their rights for a fee to be waived. But back to Simon. The first time that we saw him smile was when he got into the car with my partner. Simon liked the car journey to the shop! And when he got to the clothes store – he and 20 other kids trundled along behind my other half (“I feel like the flippin’ Pied Piper here!”) and then it was a matter of slow little smiles all round as the kids were measured for shoes and various bits and pieces of school uniform and realised what might be happening. But don’t worry folks, I found him! Sure enough, there was my son. Bonding with his new mates thanks to all things boys and yukky (see video clip ‘Bleeugh! Look at my used plaster!’) and whilst my enormous credit card purchase thankfully wasn’t declined by my marvellous credit card company, we took a few minutes to get our breath back and to capture some of the smiles of children with their new items. 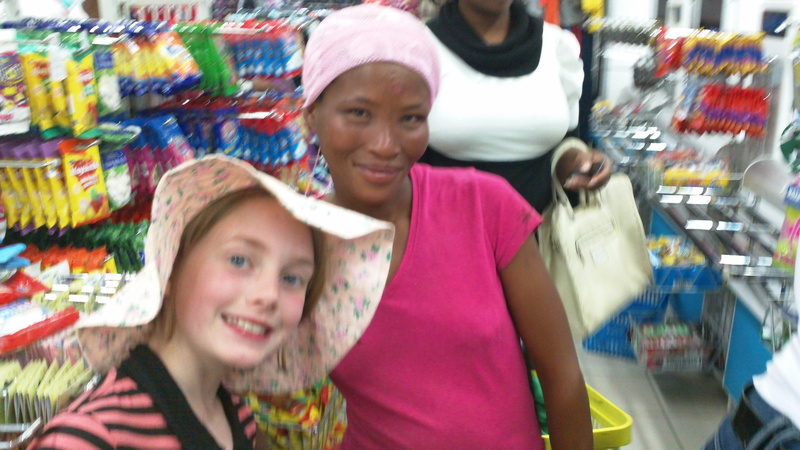 The day before, we had hit the shops big-time in Windhoek (Namibia’s capital) in order to buy the items that children need in order to attend school in this country. Many of the kids have to ‘board’ – that is, to stay over in school hostels – due to the distances. From the age of 6, children are often separated from their parents. This is traumatic enough for many, but imagine the ordeal of it all when you are too poor to be able to own even the most basic toiletries, a blanket or a pen and an exercise book. And school uniform and shoes? Well. Dream on, my friend. And all of this means that the runaway and absenteeism is an enormous issue here for schools. Not to mention the bullying. Sadly, some kids will always want to pick on the dirtier, smellier and poorer children. 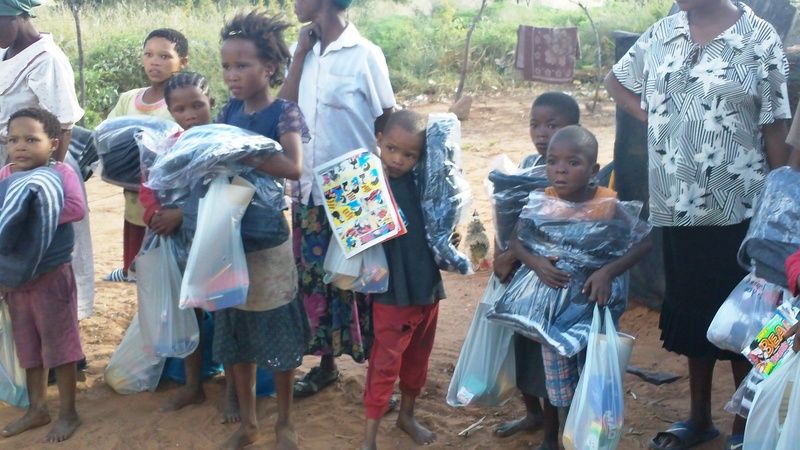 But we knew exactly what to buy, thanks to our previous work with the San Bushmen children in southern Africa – some of the poorest and most oppressed kids in the world. So, we had bought the goodies and it was off to work! This is what we had to do. In just over an hour, fill 50 bags, each with toothbrush, toothpaste, sunlight soap (for clothes and body), vaseline (black skin needs this! 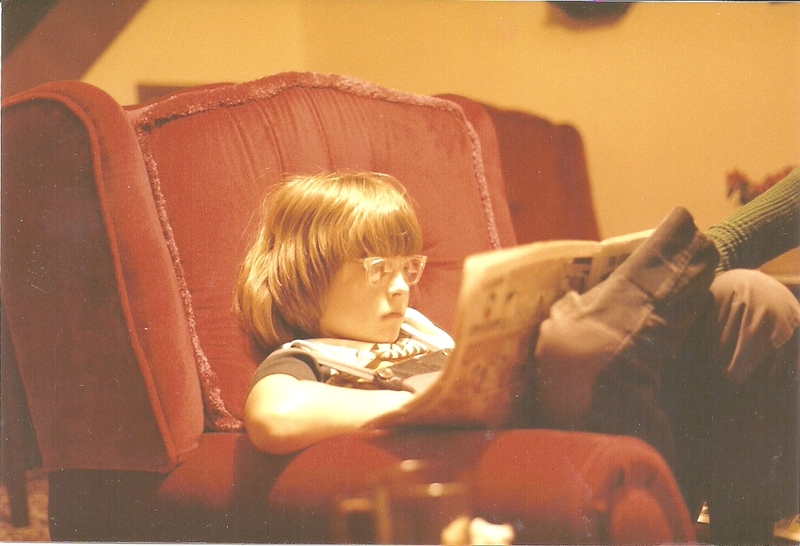 ), pens, exercise books and the inevitable sweets and ‘glowing things’ (see yesterday’s blog.) My daughter – who detests all things to do with numeracy and formal education – came into her own at this point. Ticking me and her father off for fudging our mental arithmetic when it came to splitting up bulk bags of toiletries. I’ll admit that something I was rather stressed about when returning to Namibia was the way that my kids would behave in public. It doesn’t take a genius to notice that in general, African kids who live in the sub-Saharan countries are less … hyper … shall we say – than kids from the West tend to be. And there are plenty of reasons for that, which I won’t go into right now. 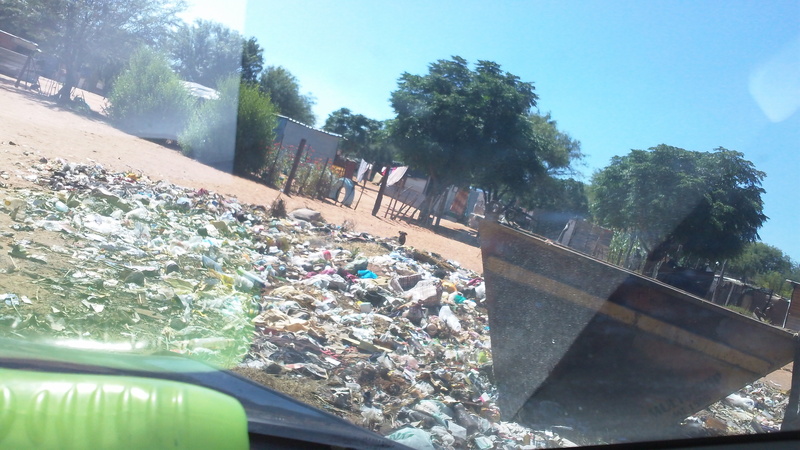 So, watching our kids’ reactions to life in some of the poorer parts of the former township areas was very interesting. 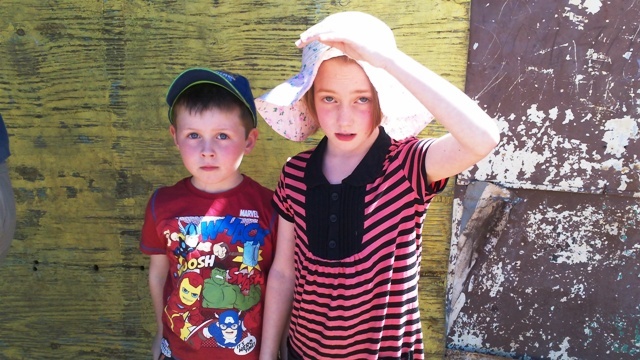 At first, as we entered the squatter camps, our son came out with “Hey – little houses made of old rubbish! Like metal and tyres and fings. Can I have one like that? So coo-wul!” Then, as it dawned on him that this way of life wasn’t ‘play at tents in the garden’ and that he was face to face with kids who had no shoes, who had only one (dirty) set of clothes, who had no parents, who slept rough, who begged in the streets and who played in the rubbish dumps … he grew a lot quieter. Nearby her baby was yarking for some more breast milk. The woman noticed us and came over to us, baby now hanging from boobie. She asked us to buy something warm for the child as their winter was approaching “He has just one thing to wear and it’s already cold in the night,” she said to us through a translator. It was all about staring. (Not for too long … see my previous posts on ‘eye contact’!) And the brown and black children with holes in their pants and sores on their faces stared back at the funny white children who had such brightly coloured clothes and such pink and sweaty faces. Thanks to our fantastic friend who lives in Epako, we spent a good hour sorting out which were the neediest of the children that we could help. Many of them were orphans (but more on that tomorrow.) 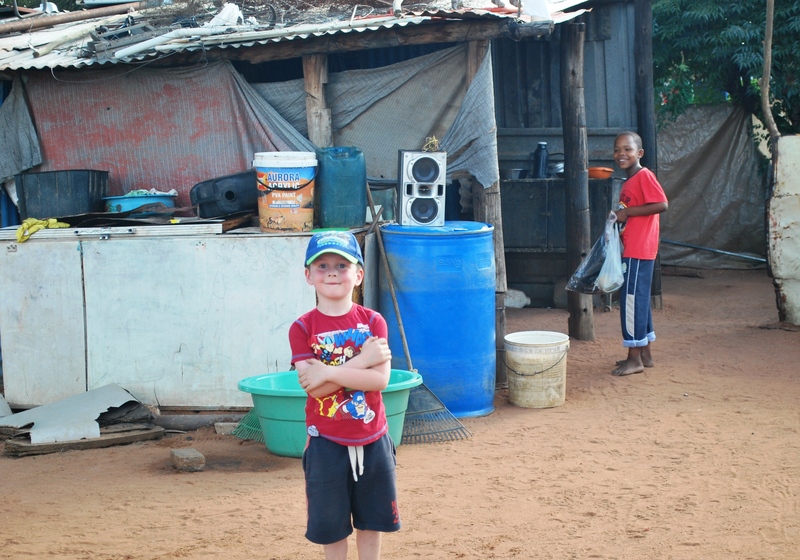 Returning to our friend’s home in a less poor part of the former township (but still very much ‘going without’ by our own standards) my son was bonding very well with the local lads and fully integrating himself into location society – wandering from home to home in the search for playmates. One of my strongest memories of living and working in Namibia is of waking up just after dawn and hearing small children a-singing. These were the lucky ones who had a school to go to – walking long distances in order to reach their lessons. Their favourite songs as they marched along were ‘Jesus Bids Us Shine’ and ‘Jesus Loves Me! This I know.’ Both of them are huge hits with kids in southern Africa – a product of the old-fashioned missionary school approach. I also grew up with these songs ringing in my ears. If you were not fortunate enough (or unfortunate enough according to my husband) to have been born n’ bred into a world of Sunday Schools – you probably won’t be aware that the words of that particular hymn, ‘Jesus Bids Us Shine’, are all about light and darkness. In the midst of planning the Great Trek Back to Namibia I was teaching the words of this song to both of my children (whilst my husband griped in the background; “Please! No more! I can’t stand it! Sing your Robbie Williams stuff. Or even Andrew Lloyd Webber instead, if you have to!”) and it suddenly occurred to me to explain to the kids about how stark the contrast is between the light and the dark in southern Africa. Darkness, even in the height of the summer, falls fast. So, those of us who love our evening BBQs (or ‘braais’ as they are called in southern Africa) wouldn’t be able to see much after 7pm there. And for the families who dwell in shacks in the former townships – especially those in the poorest parts of the areas known as ‘the informal settlements’ or ‘the squatter camps’ – their lives are ruled by a simple lack of control over the light and the darkness. Where there is no electricity, you are forced to use candles. Where you use candles, the reality of a shack fire and horrific injuries and death are all too real. And because more often than not, in these kind of conditions, the only toilet available is named ‘Go In The Bush’, those of us who are used to slurping our Horlicks at 9pm would be considered to be nutters to set the bladder up for such a test. So, imagine that you are a small child. Infant school age. And that you need to pee desperately in the middle of that darkness. Sure, the stars and the moon shine far more brightly in Namibia than in Yorkshire but would you want to take the risk of leaving the shack and the grown-ups and hopping out to the bush for a quick widdle? Snakes…scorpions…wild dogs. And the rest. Of course – the alternative would be to wet your pants. Or the worn-out blanket that you share with your brother and sister. But you only have one pair of pants. And no running water for your mum to clean the blanket in the morning. You wouldn’t dare to be so silly. 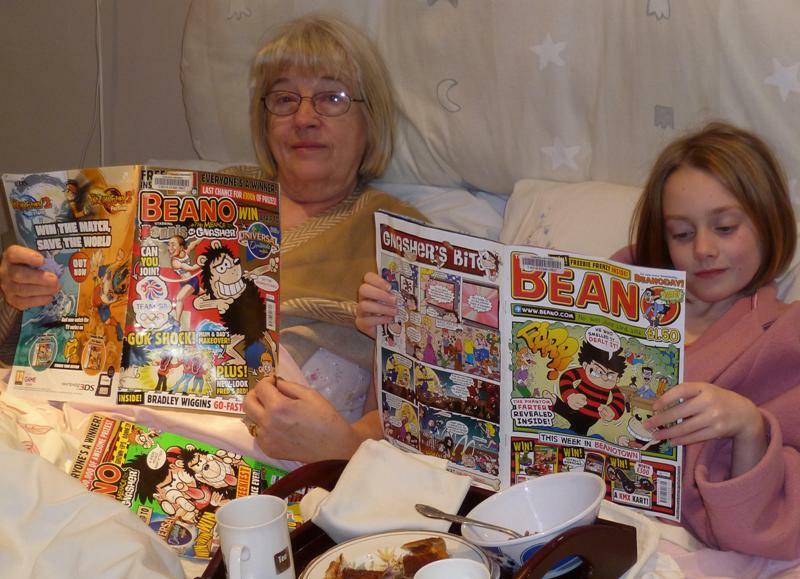 This is the scenario that I regaled my children with (yes – I’m a laugh a minute to be around, sometimes!) But before you think of calling social services and reporting me for being a morose old bag – the conversation (and the dreadful hymn singing) actually developed into a new idea. “Why don’t they have torches there?” one of my two asked me (I can’t remember which child, thankfully. Good job really, as they’d no doubt start squabbling over Intellectual Property Rights or something.) So, I explained about the lack of money to buy incredibly expensive things like batteries for a torch. But much more importantly – the more wind-up torches available, the less reliance on candles, the less scary (or lethal) ‘what could I be crouching on?’ moments in the bush and certainly a greater sense of safety for people who need to be outside during the dark hours. Suffice to say that the torches arrived and were distributed by us in the poorest corner of Epako in Gobabis, a place that contains over 5,000 people and yet you won’t find on your maps of Africa (but more on why that is, tomorrow) and yes, not a single child or adult knew what these gadgets were. But you should have seen the grin on their faces when the light dawned. Thanks for bringing them the lights, you lot. Should we care about the way we talk to each other as adults – and to our children – when it comes to the subject of ‘charity’ and ‘giving’? When our schools send requests for a few quid so that our kid can dress up as a certain bear/sport a nose/wear pink/design a motif … should we simply dismiss the marketing money and power of these massive, national charities? Or should we invest our donation pennies in the local charities down our streets? Those hospices, campaigns, the day care for elderly centres, the appeal for church spires and the struggling pre-schools … who may have fed, housed, saved, educated and employed people whom we actually know? Or perhaps we might feel that the ‘on my doorstep’ connection is a little bit too obvious. That far more than enough people already give locally – and that the smaller, more imaginative charities in our country and overseas – desperately need our attention?